"I knew something was wrong when Coach Smith walked over to me and said, 'They're taking your daughter to the hospital. You need to go home.'" 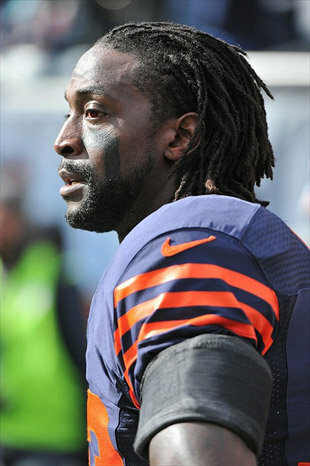 In 2008, Charles Tillman, the Chicago Bears' two-time Pro Bowl cornerback, had to leave practice because his three-month-old daughter was rushed to the hospital. He arrived to find doctors huddled around Tiana. "She was so swollen from all the fluids they were trying to fill her with. It didn't seem like it was real. I remember my wife running out. She couldn't believe it, so she just ran out crying. I was holding Tiana, and her heart rate was like 212 -- 220, at three months. My heart couldn't even do that now. The doctor was like, 'Look. There's the possibility that your daughter could not make it through the night.'" Tiana made it through the night, but was given a dire diagnosis. She had dilated cardiomyopathy and needed a heart transplant. While Tillman wanted his daughter to live, he was confronted with a problem. "It was hard for me to pray, because I didn't know if it was right for me to pray for a heart for my child because I knew that for my child to live, somebody else's child had to die. It's a tough pill to swallow." After three months on a heart and lungs machine, Tiana received a heart. "It was about eight hours of surgery, and we just waited. She came out stable, and she was awesome." Tiana is now four years old. The only sign of her transplant is a scar, which the Tillmans call her "zipper." She plays with her siblings, Tyson, Talia and Tess, who was born during the 2012 season. The experience of sitting in the hospital with Tiana and his family opened Tillman's eyes to something that afflicts nearly all hospitalized children: boredom. Children who are sick need health care, but they also need some distractions from their sickness. "My wife and I, when we were in the hospital, we saw some things we thought we could help fix. Kids would get bored. Families would get bored. Nobody wants to be there. They've got needles and IVs and they're sick, but if you're there, at least try to make the best of it." This led to the creation of Charles' Locker, which gives critically ill children and their families access to iPads, notebook computers, DVD players, portable Playstation systems and other electronic equipment to help them pass the time. There are lockers at five Chicagoland hospitals. "I'm just trying to at least get a smile on a kid's face. They don't want anyone to feel sorry for them. They just want the opportunity to be a kid."